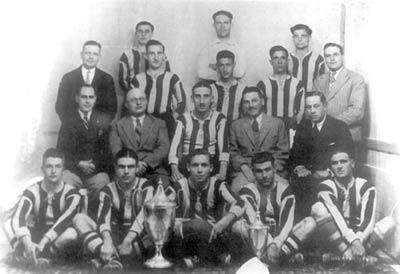 Sliema Wanderers 1933-34 Cassar Cup winners. Back row: Censu Friggieri, Joe Nicholl, J. Gauci. Standing: Pawlu Friggieri, C. Sammut, Kelinu Azzopardi. Sitting: Robbie DeCesare. Front row: Salvu Grima, Tony Nicholl, Salvu Sammut, Carmelo Cauchi, Brincat. As I wrote this article, I had in front of me this photograph of Sliema Wanderers dating back to 1934-35 when they beat Hibernians 2-0 in the Cassar Cup final. That season the Wanderers had perhaps the greatest team in their long history. With Floriana choosing to go into hibernation, Sliema took their pick of the Greens' best players. With the stroke of a pen they signed Friggieri brothers Pawlu and Censu, Salvu Grima and Carmelo Cauchi. These additions gave an already great team a look of invincibility. Hibs, on their part, strengthened the squad with goalkeeper Emmanuel 'Gejta' Azzopardi and Agius, also formerly of Floriana. Both players were in the veteran age. With their help, however, Hibs gave Sliema a stiff challenge in the league and their epic encounter against HMS Royal Sovereign in the semi-final of the Cassar Cup made them the 'darlings' of the neutral Maltese spectators. Sunday, March 4, 1934 was a memorable day in the history of Maltese football. The occasion was the first all-Maltese Cassar Cup final in 11 years. Hours before the start of the game, the Empire Stadium was already full to capacity. When the gates were closed, about an hour before kick-off, many people began to climb over the walls of the ground. The crowd was evenly split in two sides. The enclosure and the part of the ground traditionally known as the Sliema side was a sea of blue and black flags. The opposite side and the end usually allocated to Floriana, were packed with Hibs' supporters. These were joined for the occasion by hundreds of Floriana followers who in the absence of their team adopted the Paolites as their favourites. In the week before the encounter, Hibs had captured the imagination of the crowds with a superb performance against HMS Royal Sovereign in the semi-final of this charity competition. It took Hibs three gruelling matches before they managed to beat the sailors for a place in the final. The Wanderers had a much easier task in the qualifying phase. They beat the Cheshire Regiment team 4-2 in the other semi-final. Therefore, they entered the stadium for the final all bright and sprightly while Hibs had to dig into all their reserves to find enough energy to contest the final. A couple of minutes before the 3 p.m. kick-off, Hibernians trotted out of their dressing room amid the deafening shouts of their avid supporters. A little later the Wanderers were similarly greeted by their fans. Missing from the Hibs team was Rogantino Pisani. He was injured in the game against Royal Sovereign. Hibs missed his services and the defence lost its usual solidity. The first quarter of an hour was all in favour of Hibernians though. After about 20 minutes the Blues started to come into their own and it was according to the run of play when Tony Nicholl scored the first goal with a shot from outside the penalty area. Five minutes later Salvu Sammut won the ball on the right, raced up to the touchline and, dribbling his way through Hibs' defence, centred to Brincat who promptly shot into the net. At half-time the score was 2-0 for Sliema. In the second half Hibs lost heart and, although they prevented Sliema from scoring further goals, they never troubled Joe Nicholl in goal. It was obvious that they were feeling the strain of the semi-final series against HMS Royal Sovereign. Sliema were worthy winners and fully deserved the applause of the thousands of spectators present at the stadium. It was a great moment in the club's history when Robbie DeCesare received the coveted trophy from Sir David Campbell, the governor. Sliema Wanderers: J. Nicholl, P. Friggieri, C. Sammut, R. DeCesare, K. Azzopardi, J. Gauci, S. Grima, T. Nicholl, S. Sammut, C. Cauchi, Brincat. Hibernians: E. Azzopardi, E. Borg, V. Miller, T. Theobald, W. Mizzi, J. Edwards, N. Formosa, Scicluna, S. Busuttil, Brincat, C. Agius.